50 ANNIVERSARY MANN + HUMMEL – Filtros Castello S.L. 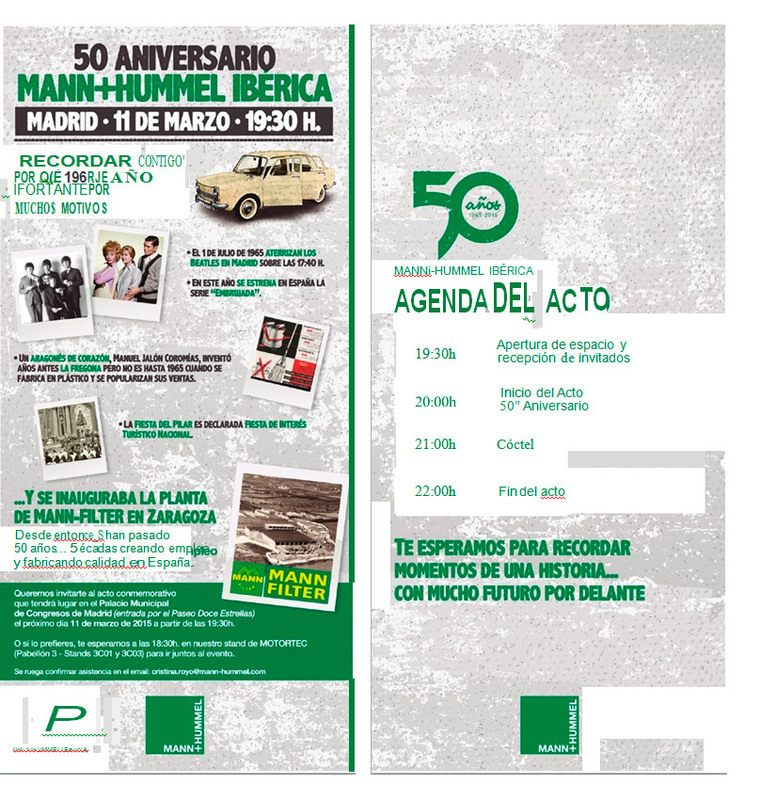 he company Mann + Hummel Iberian, dedicated to the automotive industry, celebrates the 50th anniversary of his birth with an Aragonese spirit and with a committed team that has led him to become a world leader in the manufacture of filters since its founding in 1964. Located in the logistics platform of Zaragoza since 2004, this subsidiary of Mann Hummel international group based in Germany manufactures 1,250 different references and forecasts a turnover of 140 million euros in 2015, compared with 134 million the previous year. 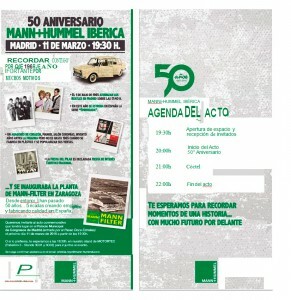 In a ceremony that took place at its headquarters in Pla-Za, the company celebrated its 50th anniversary with the presence of President of the Government of Aragon, Luisa Fernanda Rudi, and people who have occupied the general direction of the Company: José Ignacio Murillo (1965-1999), Franz-George Geiger (1999-2009), Steffen Schneider (2009-2012) and Javier Sanz, current CEO. During this meeting, which was also attended by the Government Delegate in Aragón, Gustavo Mayor and the Councillor for Citizen Participation of the City of Zaragoza, Lola Ranera, the first managing director of Mann + Hummel Ibérica, José Ignacio Murillo, he recalled the path a company founded in 1964 with the name of Catalonia -Taca- workshops, which by then was located in the Catalonia Avenue, number 218. “We had to devise things to do, because there were not enough cars to make filters” in those early years until in 1971 the German Mann + Hummel took 90 percent stake in the company Taca. From there, he renamed Mann Filter Zaragoza and started a volume business, which made it the “most important” filter manufacturer in Europe, to the extent that it produces one third of the production of this material cars and trucks in Europe. In 2004 he was one of the first companies that started the logistics platform of Pla-Za, in an area of ​​80,000 square meters construidos- -34,000 meters, with an investment of 40 million euros and currently working in some 700 employees. Recalling the history of the company, José Ignacio Murillo has especially emphasized the “Aragonese” spirit of a company that has always taken the name of Zaragoza everywhere and has been able to employ more than 1,000 people, with “salaries very worthy “during his career. “The Germans let themselves be Aragonese and we do so,” he said. Meanwhile, the current CEO of Mann + Hummel Iberian, Javier Sanz, has emphasized the “human”, “robust” and “committed” to the company “solid and strong” team, which aims to continue to grow ” ambition “but also with” modesty “, unpretentious. For his part, the president of the Government of Aragon, Luisa Fernanda Rudi, who has previously visited the facilities of the company, has indicated that the founders knew Taca “see the future”; “Seize the opportunity” and “jump on the bandwagon of a German company” at a time when “Europe was another world,” compared with Spain. It also underlined the Aragonese companies that are leaders within their multinationals like General Motors or own Mann + Hummel, which, in his view, said “much of the way we work” of its teams. In fact, it has also noted that Mann + Hummel made filters for the new Opel Mokka model to be built at the General Motors plant in Figueruelas (Zaragoza). Finally, he congratulated the company not only to stay “afloat” in the years of economic crisis, but by being able to be competitive and highlighted the weight of the Aragonese industry in the Gross Domestic Product (GDP) Community, 22.5%, closer to the German middle-a 24% – than the Spanish (16%).